The team behind the Lisa Stirrett Glass Art Studio, left to right: Lisa Stirrett, Stacy Brockberg, Erika Giesbrecht, Madi Bowe, Tara Morris and Anna Douglas. 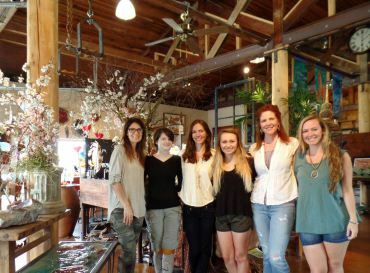 Building community is the highest priority for the Lisa Stirrett Glass Art Studio, according to Silverdale artist and founder Lisa Stirrett. The studio’s anniversary party on June 20 will launch the team’s newest venture. Personally, Lisa’s focus has included both her local and global communities. Now, she has found a way for her art and business to also help those in need. She wants to shine a spotlight on organizations and individuals who focus their efforts on bettering their communities, and the two-year anniversary marks the beginning of this endeavor. During the anniversary party, 5-9 p.m. on June 20, the studio will launch “Products with a Purpose.” To help support different local and global organizations, the artists at the studio will create products where a portion of the proceeds will be donated to the partnering charities. Their first Product with a Purpose is a $26 tea light for Walk in the Light International. Walk in the Light brings water, medicine, quality education and other basic needs to communities in Burkina Faso, Africa. Dedicated to giving a “hand up, not a hand out,” the organization provides community members the tools they need to create a better future for themselves. The June 20 event will include food, music, door prizes, spirits and an introduction to the new “play area.” There will also be a naming contest for the Native American warrior Lisa built that’s now anchored out front.